Music accompanies one through the melancholic nights. Melody and harmony hold our hands through the rough and the calm. We are trapped in a smoky and dimly lit labyrinth and music is the true escape to eternal bliss. The ability to stand on one's own is a shadow of the innate ability to balance on harmony. The chaotic chasm of our lives seizes our union with the inner tunes. We are disintegrated and music integrates us. Music is the universal language that binds us together and requires no word in particular to connect or communicate. A categorised serenity is found in music that nowhere else in the world can be achieved. Music is a talent one can acquire with sheer dedication, compassion and concentration. Finding an esteemed and creditable music school, however, in the crowded alleys of Dhaka city is a challenge one is confronted with. Fawzia Chowdhury, the principal of Sound of Music reveals that music shares love, peace and understanding integrating the power to connect humanity. This school places no discrimination on those who long to walk through the beautifully engraved path called music. Due to lack of opportunities the many talents hidden among us go unnoticed. This school intends on extending the warm welcome to the talented students who are faced with socio-economic barriers. Dr. Ruposhi is a solo concert violinist who specialises in North Indian Classical music. She has received her doctorate from Baroda. Her courses comprise of one of six months and one of three years after which the graduation from Sound of Music is certified. Guitar is taught by Ashok Paul; the present music producer of Radio Bangladesh is a former teacher of BAFA. He has trained in Kolkata under the supervision of Guru Shomir Khasnabis. He further specialises in Western beats and stresses on individual needs. He assesses his students individually with emphasis on the roots of the strings. Amalija Maya, a trained Bosnian soprano singer teaches Western vocal. She has directed various children's choirs and has been a soloist since the age of nine. Pritom Kumar Das has trained rigorously for twelve years at the Anondo Skonkar Centre at Kolkata and has appeared on several TV shows over the years. 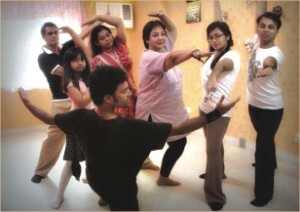 His field of expertise constitutes of samba, salsa, flamingo, jazz, ramba, hip-hop, modern dancing and cha-cha. With his dance regimes anyone is fit for the dance floor. Borsha, a graduate from Charukola Institute further extends her arms to the arts. She teaches painting and does not fall short of spreading the colours through the lives of her students. Dr. Julia trains her students for five long years transforming them into pianists. This Georgian pianist holds the credential to sign internationally acclaimed professional certificates to quality-endorsed students. Starting this October, she will be attending to students from advanced levels and her experience in the courses from Russia and Europe labels her an expertise at her finest. Natasha is a Russian piano teacher with former experience of five years in her designated field. She designs her piano courses accommodating the students' requirements. Philippe, a French pianist, has designed his own course and progresses on individual needs. He has completed a ten-year course on piano at Classical Music Academy in France and a two-year course on jazz in China. He has been teaching the instrument professionally for more than a period of eight years. Fawzia Chowdhury holds etiquette or grooming lessons every Friday. She has trained in the UK for several years on etiquette and feels that socially representing oneself is an art. Sound of Music wants to induce a revolutionary music movement into the nation. Integrate the dissolved pieces with the arts and build up a sacred union, abiding in harmony. The tunes blend in to soothe and to harmonize a being. Only when one is truly in harmony with oneself can then a synchronized chime reverberate through the corridors. If one wants reasonably priced books in the heart of the city, there is the inviting "Gyankosh". Here jovial and helpful Farouk and Azad, with his red cheeks and endless bonhomie, are there to help one pick books on fine arts- whether they be books on Tagore's sketches and paintings or the European master painters and sculptors, ranging from Kandinsky and Picasso to Turner and Michael Angelo, Raphael and Titian. If one is keen on architecture, there are books galore on castles, temples and the nitty-gritty details for practising architects and students of that discipline. Mind you, Hassan Ali, the beaming manager, with his understanding nods, is always close at hand to supervise the smooth flow for the book lovers. Others' craving for plays and poems will find anything from the treasures of both the east and west like the works of Omar Khayyam, Kahlil Gibran, TS Eliot and George Bernard Shaw. These tempting books that take one away from the dull drudgery of everyday existence sit side by side with writings on world history by Jawaharlal Nehru and outpourings of contrite Indira Gandhi. Coffee table books, illustrated with masses of photographs and illustrations take you through the realms of the charismatic Mughal emperors and the flamboyant and ambitious British in India, wondrous writings on the fateful Partition of India of 1947, such as "Train to Pakistan", are there, along with irresistible books on earlier emperors and viceroys, along with the ladies in their lives such as the novels by M M Kay. Pearl S Buck and Han Suyen's innumerable graphic descriptions in their pages on the plight of the common farmer and fishermen are not to be ignored either. Books on "The Beatles", "Elvis" and other icons of pop musicians of the past and present are found here as well. There are tomes on biography and autobiography like that on Gautam Buddha, Napoleon Bonaparte, Mahatma Gandhi, Nehru and Dalai Lama. Many have a penchant for American and sub continental heads of states -- and this type of intellectual thirst may be quenched at this oasis of books, books and more books. Fiction like "Gone with the wind" and "Roots" and "Thornbirds", along with "Where rivers run" are well-loved novels that maybe enjoyed more than the unforgettable films, based on poignant facts of history. These too are easily often available in various editions, to fit every budget of young and old. Books in European, Indian and the cheaper Bangladeshi editions bring us other delights of life and living. These may focus on the subcontinent, the US or Europe or even the Middle East and Far East. These bring in scenes of veiled, seductive beauties in the harem, pawnshops and gay bazaars with their snake charmers, readers of palms, sellers of carpets and scintillating trinkets and brass, Life in these books stretch from gay Paris to the humming boat-markets of Cambodia, Vietnam and Burma. Facts like "The Third Reich" and Winston Churchill's observations on World War II may be found here too, or conveniently ordered for from overseas. So may any other delightful book on Arts or Science. Heavily illustrated encyclopaedias for children and adults -- focusing on various subjects like paintings, birds, flowers, stitch-craft etc. These sit comfortably with local and overseas books on raising children, bonsai, cookery, health tips like yoga, meditation in other eastern ways following Chinese or Japanese gurus, stamps, butterflies, and coin collections, gardening, tattoo, colouring on the floor ("Alpana"), lives of famous film stars - you name your passion and you'll find it at "Gyankosh" sans doubt. Books on music, dancing and stagecraft and other interests are sometimes found here too. Even sports like cricket, as seen by Aussie experts, travel through exotic places like the Chittagong Hill Tracts, photography like that by Dr. Noazesh Ahmed and other overseas experts, with their attraction of innumerable illustrations in black and white and colour, are here to be picked and sampled. What brings in the routine revenue are the textbooks, exercise books and stationary of well-known schools and colleges. Colour pencils, paint boxes and paint brushes are also here, along with other items for students, which doting parents with large-eyed children in tow and students with shiny spectacles make a beeline for. Shiny toys-- within reasonable range for the bourgeoisie - are here as yet another irresistible attraction. Last, but not the least, are Enid Blyton books for children, and colour magazines from around the world are among the other hot favourites at this bookshop. "Some like it hot" in the films, but others are content leafing through the pages in the quiet of their "hearth and home". Carried away into the world of imagination and factual narrations, these soothe the nerves and serve as the fountain of life, more than actual pep pills. "Gyankosh", more than most other shops, draw crowds of buyers the entire day through. The milling and asking to Farouk and Azad go on till the closing time of eight. Then, "bookworms" must cry "Hoa!" to their urge to "stand and stare" by the bookshelves - sometimes even cheek by jowl. Just as Cinderella hated parting from her prince, at the strike of midnight, so abiding readers reluctantly shut up their curious minds, and wind their way home. This is, of course, with recurrent plans to venture here again, again, and yet again. "Gyankosh" remains like some muse for eager, enquiring minds. You don't have to break the bank to make your living space look brand new. Flip to the centre, and we'll show you how it's done. Another cheesy title, you might think; rhyming words to create dramatic effect. In fact, if I saw a title such as this I would probably have thought the same. Still, I ask you to bear with me, as the culture of vultures I am talking about should not be all-too-unfamiliar. Vultures are carrion-eaters. They wait for other creatures to die, so they can swoop in and enjoy a feast without having to struggle with the prey, although other vultures do pose a stiffer challenge. Enough of the animal kingdom; now for the familiar part. If you have been living in Bangladesh for the majority of your life, this probably has happened to your family or to other families you know. Shortly after the demise of a family member, and sometimes not even tarrying to let the dust settle on graves, the vultures swoop in. By now, those in the know have realised what I am talking about. Yes, I am talking about the struggle for family land, or jomi as it's more commonly known and fought over. The history behind the struggles is almost always the same. Ancestors lived together in the village and owned lands, individually and jointly. Ensuing generations saw a dilution in the ownership as more and more family members were born. As soon as the head of one of these families passes away, their share of land is disputed and unless the family in question has a real stomach for a fight, their birthrights fall into the beaks of the vultures. Of course, that is an oversimplified version of often more complicated issues, but that is roughly how events generally unfold in this regard. Sometimes there is stronger motivation for people to act in this manner. There might have been festering enmity between families; jealousy is often a factor. These ugly sentiments simmer under the surface till one of the families lose their patriarch and the others know that they are defenceless. Vultures, the actual birds, eat carrion because that is what their internal mechanism is geared towards; they have been shaped by nature in this way. We, on the other hand, are human beings, supposedly the most intelligent creatures to have breathed the earth's air. We have been given so many resources by which we can better our lives, yet we wantonly hurt and victimise our own blood relations when they are desperate for helping hands and some kindness. Come to think of it, I probably owe vultures of the avian variety a heartfelt apology.